Jan 19, 2019; Syracuse, NY, USA; Syracuse Orange forward Marek Dolezaj (21) looks to pass while being defended by Pittsburgh Panthers guard Au'Diese Toney (5) during the second half of the Orange's 74-63 win over Pitt at the Carrier Dome. Mandatory Photo Credit: Kicia Sears, The Juice Online. WHAT HAPPENED: Up just three points at half, the Orange went on a 13-0 run early in the second half to take control of the game. Tyus Battle, who shrugged off a slow start, contributed four points and capped the run with an assist to Paschal Chukwu as the Orange took a 40-27 lead with 12:20 to go. Battle’s 3-pointer followed by a steal and dunk put the Orange up 50-31, and SU withstood a late 10-0 run from Pitt to win its second straight ACC game. ANALYSIS: When most prognosticators looked at Syracuse’s early ACC schedule, they saw a manageable first half of January, with an opportunity to go 4-1. That’s exactly what happened on Saturday, though not quite the route most would’ve expected. An inexplicable loss at home to Georgia Tech followed by an equally shocking win on the road at No. 1 Duke, and then a more expected win on Saturday over the Panthers has the Orange at 13-5 (4-1 ACC). It has momentum for what will be a more challenging upcoming schedule, with upcoming games at Virginia Tech and Florida State in the next few weeks. 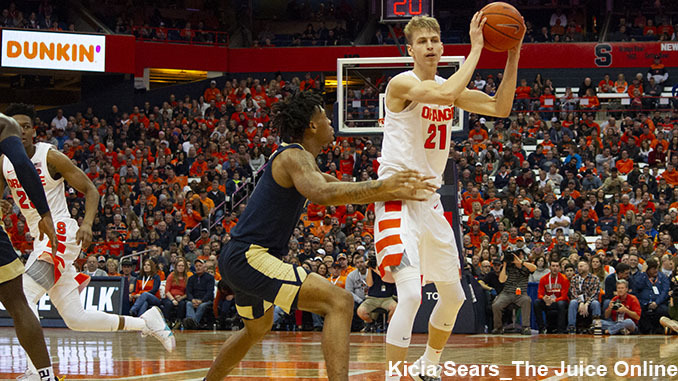 If Syracuse can continue to win games where it’s favored as it did against Pitt, the Orange may not need to sweat out Selection Sunday for a fourth straight year. HERO: Battle led the way with 22 points on 9-17 shooting from the field while Buddy Boeheim scored a career-high 13, shooting 4-5 from downtown. As a team, the Orange shot 46.3 percent from the field and 12-26 from beyond the arc. They also assisted on 17 of their 25 field goals, with Marek Dolezaj tied for a game-high honors with five assists to go with four points, six rebounds, two steals and two blocks. ZERO: Free throws didn’t matter as much in this game, but the Orange needs to shoot better than 12-23 in closer games. Syracuse backup point guard Jalen Carey didn’t play, with Jim Boeheim elected to go with Battle at point guard for large stretches of the game. WHAT’S NEXT: Syracuse stays home, hosting Miami on Thursday at 8 p.m. TV: ACC Network.